In 2005, Degenerate by Bristolian duo Vex’d managed to comprehensively upset the apple cart of dubstep that was, by that point, racing away into the top 20 lists of every journo on these shores. Degenerate was utterly transgressive in the way it took the deep bass grooves that characterised dubstep, and then ploughed them into the dirt via a deluge of aggressive synths and excoriating percussion lifted straight out of harsh techno and EBM. Fast-forward six years and Vex’d is, sadly, no more. But if the duo’s harsh industrial approach has been sacrificed, you can’t say as much for the spirit of exploration that animated Jamie Teasdale and Roly Porter. For whilst the latter has carried on exploring the heavier reaches of dub and dance music, Teasdale has morphed into one of the most adventurous producers of the last few years, taking his Kuedo project far beyond the confines of dubstep and into fresh, exciting and innovative zones. Last year’s Dream Sequence EP was already a sign that Teasdale was keen to move beyond the claustrophobic constraints of Vex’d. Embracing the garish aesthetic of Joker and Zomby, with their references to video games and 80s movies, Teasdale’s centrepiece on Dream Sequence was 'Starfox', a sumptuous post-dubstep romp propelled by rainbow synths and infectious Nintendo-inspired beats. It retained the aggression and head-banging qualities of dubstep, but was resolutely 'other'. Despite that, nothing prepared the world for Severant. In many ways, Teasdale’s debut album as Kuedo has a lot of precedents, yet, weirdly, it seems to stand alone, a bright fusion of scattered beats and clear synth patterns. Somewhere beneath it all, you can feel the dystopian pulsations of dubstep, with sudden surges of anonymous vocal lines and unexpected bass eruptions. But, essentially, Severant is in thrall to the mystique of vintage science fiction. Remember those sweeping brass synths that defined Vangelis’ iconic score for Blade Runner? Well, Teasdale revives them with brio on Severant, marrying the resultant emotionally affective melodies to insistent drum patterns to deliver a wide-screen vista that comprehensively breaks the straight-jacket of conventional electronic music. 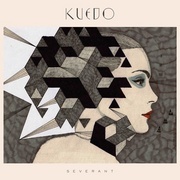 Kuedo has described Severant as a vehicle to explore notions of escapism and futurism and, from the opening mournful synths of 'Visioning Shared Tomorrows', there is strong emotion at play here. It's a deep melancholia that once again brings up memories of Blade Runner’s murky romanticism, but which equally haunts a lot of the music of late-period Tangerine Dream. Teasdale’s melodies are hesitant, like waking dreams or elusive memories, and you can almost draw a parallel between these wistful future fantasies (track titles include 'Ant City', 'Onset (Escapism)' and 'Reality Drift', fer crissakes) and the world-weary ambience of Leyland James Kirby. However, Teasdale hasn’t left his dubstep roots behind completely, and where Severant really shines is in the way he so masterfully melds these elegiac synth patterns with driving beats. Eschewing - mostly - the heavy bass and rhythms present on Dream Sequence and Degenerate, he instead turns to the loping patter of Chicago house, as well as hints of the syncopated nervousness of hip-hop production. As such, tracks like 'Onset (Escapism)' and 'Scissors' have a nervous, almost glitchy energy, albeit one where the intensely beautiful synths mould and shape the edges into something bordering on the cinematic and elated. 'Salt Lake Cuts' is the closest Severant comes to standard dubstep, although it’s of the subdued, wee-small-hours variety favoured by the likes of Burial and Darkstar, as disconnected vocal lines penetrate a wall of shuffling beats and bass grooves. 'Seeing the Edges', meanwhile, draws out the sound of a remote drum, with reverb and echo making it sound like a lost metronome pounding away in the heart of a labyrinthine machine, as crisp synths and elusive tinkles swirl around in the ether. With its emphasis on atmosphere over rhythm, you could almost draw a line between Severant and the underground, post-New Age sounds of Oneohtrix Point Never and Emeralds across the pond. Like them, Kuedo has turned to the past as a way of re-interpreting the future in wistful, escapist terms. But his background on the harder edge of modern dance music means that, for all its delicacy, Severant never feels retro or overly derivative. Instead, Teasdale may just be pointing to a new future in electronica, one that doesn’t so much yearn for a better future, but rather drives for it.